I am learning a lot about people who are standing for their marriages. I've talked about it before. Some have been standing for less than a year, some for a couple of years, some for 4 or more years, while their spouse is engaged to another person. Can you imagine? Can you put yourself into the shoes of any of these people and imagine how a day like today must look and feel to them? My heart aches for these standers. Some are beginning to lose hope. God saw them through Christmas and New Year's. Now Valentine's Day is here, and the enemy's arrows are shooting faster and sinking deeper than they have before into the minds of those who have chosen to stand for their marriages. I've listened to their stories for a few months now, and it seems that they are all heavily under attack right now. I don't think it is a coincidence that it is Valentine's Day. Happy couples will crowd stores and restaurants today, making those without a significant other or worse, those whose significant other is with someone else, feel alone and weary. My hope and prayer is that standers can unite and have an incredible day IN SPITE OF the present circumstances. Jesus never said we wouldn't have trouble in this life. I can't even remember what happened a year ago today, on Valentine's Day. All I remember is getting cards from the kids, and a card from Kris with hand-written words that I dismissed as quickly as I read them. Kris and I started dating on Valentine's Day, and even in the midst of all our chaos and turmoil, we always made it a point to celebrate that as a special day. Not because of the holiday, but because it symbolizes when we had our first date. A year ago, I didn't care. I didn't feel ANYTHING towards my husband, and struggled to muster up the energy and courage to even smile at my kids. I certainly couldn't look anyone in the eye. Not after what I did. And I did nothing for any of them for Valentine's Day, which I usually do. I know I didn't get Kris a card, or even give it a first thought, let alone a second! Today is just another day. Some people choose to do something a little extra, to celebrate with those that they love. But it doesn't have to be a spouse or significant other. It can be a child (who better?!? ), a parent, a dear friend who understands your pain. All I am saying is that this day shouldn't be any more reason for you to give up than yesterday was. Just because this is the "day of love" and you may be away from your love, doesn't give you an excuse to give up hope. 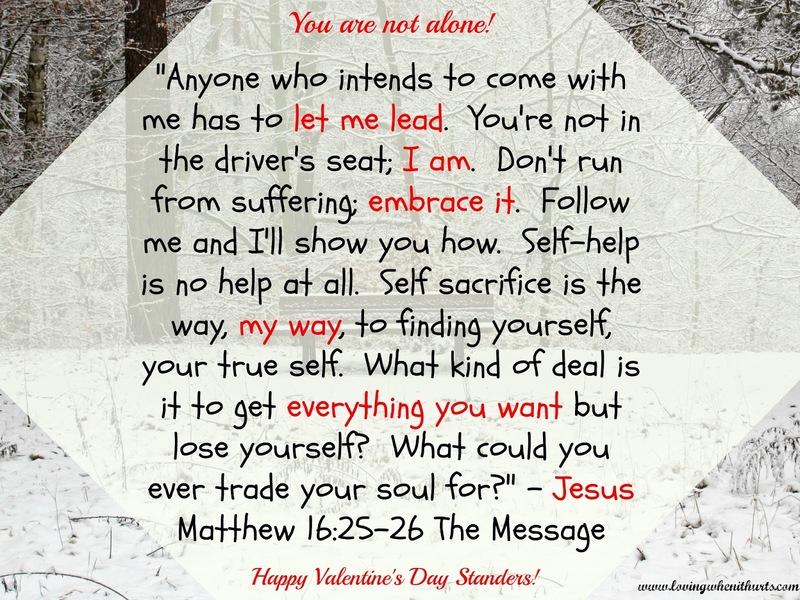 Or to forget that your TRUE LOVE, Jesus, is right beside you. He always has been, and He always will be. So maybe you don't get a card or flowers, or your spouse doesn't come home today. Maybe he does. God still works miracles, you know! Use this day to embrace and be embraced by the only Man that understands what it means to love you the way you ought to be loved. Let God's love surround you today and when you see those happy, smiling couples, thank God that they aren't experiencing the pain that you are. Praise God through this storm of your life, because maybe a year from now you'll be looking back, like I am, and seeing what a difference a year can make! Listen to this song. It is where your focus should really be today, and every day going forth. Don't lose sight of God's promises.